As I type these words, a group of friends are gathering in Albury, the town I spent 20 years, to mourn the death and celebrate the life of a gorgeous woman who died way too soon. Kim was one of those positive, radiant women who was like sunshine. Her enthusiasm and passion for life was infectious. And she made you feel as though you could do things. When I think of Kim, so many words spring to mind but three in particular are abundance, generosity and connection. My life is richer for having met her and there is a sadness for so many people now that she is gone. Sacks talks about a response of gratitude: I cannot pretend I am without fear. But my predominant feeling is one of gratitude. I have loved and been loved; I have been given much and I have given something in return; I have read and traveled and thought and written. Every morning, as I put my feet to the floor, I say words of gratitude. Some mornings I sleepily utter a formal phrase, other mornings a jubilant list of things that bring joy. I didn’t need Kim’s death to remind me to be grateful that I lived to meet my grand daughter. And now, some mornings I will use this wonderful sentence from Sacks’ article: I have been a sentient being, a thinking animal, on this beautiful planet, and that in itself has been an enormous privilege and adventure. 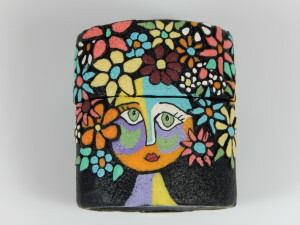 My pictorial choice of a vibrant, joyous piece of jewellery is no coincidence. It celebrates the life of a vibrant, joyous woman and expresses my gratitude for another day. This entry was posted in Uncategorized and tagged death, Gratitude, Kim, Oliver Sacks on February 26, 2015 by wendy. Thank you dear Deb. Many people will be both mourning Kim’s death and celebrating her life. Two children have lost their mum too young. Very sad. Embracing life with gratitude and curiosity and openness is really all you can do isn’t it?